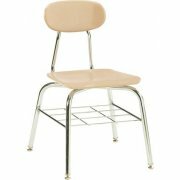 Academia's hard plastic school chairs are made to withstand all the everyday abuse your super-energetic students can throw at them. Their 16-gauge tubular steel legs and 14-gauge steel back supports make these chairs unbelievably strong, while an ingenious gooseneck design and self-leveling glides provide added safety and stability. 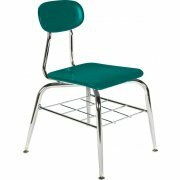 An Under-seat steel-rod Book Rack provides convenient storage, while adding extra strength and rigidity to the chair. 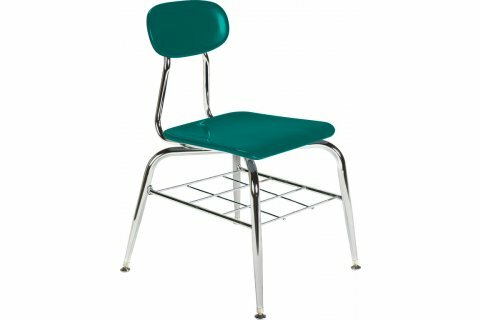 Our powerhouse of a chair also comes with a chrome plated frame, a wide choice of colors and leg glides made in the USA. Convenient Storage: Steel-rod book rack reinforces and strengthens the chair frame and provides easy access textbook storage. 16"W x 14"D x 8"H.